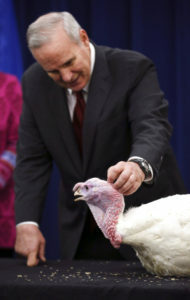 MINNEAPOLIS (AP) — Low food prices have driven the cost of a Thanksgiving feast down to its lowest level since 2010. The American Farm Bureau Federation says the average nationwide cost of a holiday meal for 10 people is $48.90, or less than $5 per person. The farm group’s annual survey released Thursday says that’s a 22-cent decrease from last year’s average. Farm Bureau Chief Economist John Newton says an ample turkey supply is a big reason. Retail turkey prices are at their lowest since 2014, coming in at $21.71 for a 20-pound bird, or roughly $1.36 per pound. Milk, fresh sweet potato, canned green pea and dinner-roll prices are also down. The survey based on a standardized menu also found modest price increases for fresh cranberries, canned pumpkin pie mix and stuffing.